Looking tired at the end of a hot run. I participated in my first triathlon of the season, the inaugural Toronto Festival Triathlon. 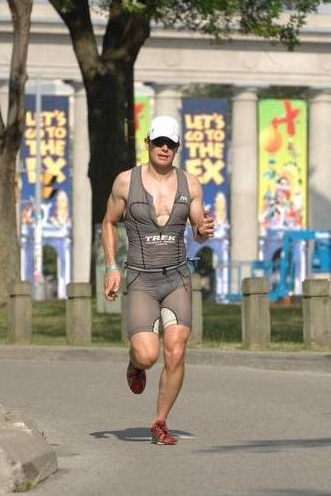 No I don’t know why they called it a festival triathlon. Maybe the “festival” part of the name was for the beer that you could apparently buy afterwords. In all seriousness though, I thought that for a first kick at the can at a downtown olympic tri, it was run really well and was a great race that I’d definitely do again. A bit about the race. The swim was in Lake O, in and around Ontario Place. The water was not to weedy and warm about 21 C. The deep water start was nice, not too crowded to the first buoy. Getting out of the water was easy and smooth with a nice step out of the water. There were lots of volunteers ensuring you didn’t slip or fall in the stupor that you can be in when you go from swim position to the vertical run position. The transition area was well laid out and spacious. The bike was amazing! What can beat biking on the Gardiner and DVP, very cool, safe and smooth. The run was on the Lakeshore bike path and well supported with water and Gatorade. The path was mostly free of bike traffic and wide enough for the volume of runners. The only improvement would be moving the finish closer to the transition area. The transition area was over 1km away from the finish, so the “festival” was kind of spread out between the transition area and the finish. The post race gathering would be improved by keeping the transition and finish areas close together as you always need to walk back to the transition area to get your bike and gear at the end of the race. Also the event was a bit stingy with the food at the end of the try, really half a banana per athlete, we just swam 1.5k, biked 40k and ran 10k. I’ve seen 10k running races with more liberal post race food. I’m sure that next year the TO Festival Triathlon will continue and be even better than it was this year. I’m really happy that Toronto finally has an Olympic Tri in the core of the city and really hope it continues. This entry was posted in Uncategorized and tagged 2012 Toronto Festival Triathlon, Festival Triathlon, Post Race Review, Review, Toronto Festival Triathlon, Toronto Island Triathlon, Toronto Triathlon, Triatlhon. Bookmark the permalink.